Name a brand of television: Sony, Samsung, LG, Panasonic, Toshiba, JVC, Philips, Magnavox…these brands are familiar to most people. 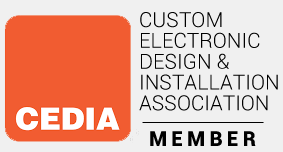 However, consumers tend to not be as familiar with companies that manufacture outdoor televisions. 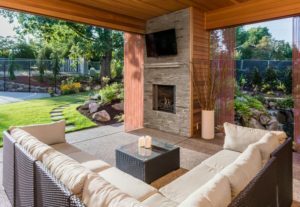 When looking to add an outdoor television to your space, you want to make sure you have done your homework in researching costs, features and functions of your outdoor TV. 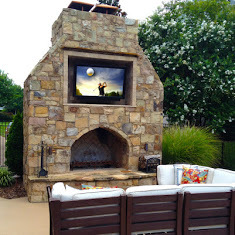 Outdoor TV’s are very durable and weatherproof and have the same features that you would expect in a regular television. 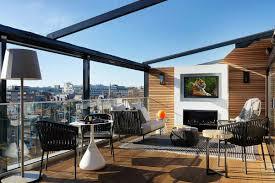 Manufacturers of the outdoor television are keeping with today’s trends and even have a line of 4K televisions. Designed and engineered right here in America. All-weather outdoor LED-LCD TV’s delivers superior brightness, while resisting the harsh effects of rain, dirt, insects, UV rays and extreme temperatures. Reputation for toughness and durability; their products have lasted for years in some of the hardest climates in North America. SunBrite TV’s run 32″-84″ and are priced from $1,499 – $24,995*. 2-year warranty on their line of televisions. Clients include: Yankee Stadium, Baltimore Orioles, Wrigley Field, Cracker Barrel, U.S. Marine Corps and many others. Manufactured right here in the United States. Built with the amount of sun exposure in mind. Glare is a huge component of watching TV outside and SkyVue’s models are rated for either partial sun or full sun exposure. This line of televisions boasts a 2-year warranty. Televisions range from 32″ to 80″ and will cost you anywhere from $1,450-$12,700* depending on size, functions and features. Clients include: Walt Disney World, Universal Parks & Resorts, Washington Nationals, CBS, Buffalo Wild Wings and Hard Rock Cafe. Las Vegas-based company uses today’s popular brands of TV’s (Samsung, Sharp, LG) and converts them into all-weather televisions; allowing them to vent heat while keeping rain or snow from entering the enclosure. Invented a unique, adjustable membrane cover to protect the inputs and outputs of the television. Also applies a special UV treatments to the enclosures to protect against humidity and insects. TV’s tested in one of the hottest, dry climates on the planet – Las Vegas, Nevada from 145 degrees F to the sub-freezing temperatures. Products include a 1-year warranty. TV size ranges from 24″-85″ and prices from $695-$19,500*. Includes a line of 4K outdoor televisions. Includes a line of Jumbo Outdoor TV’s from sizes 115″-215″. Clients include: SeaWorld, Disney, Carnival, SanDiego Zoo, Memphis Zoo and NASCAR. Takes existing TV’s (Samsung and LG) and uses conformal coating to protect the components of the TV from high heat, extreme cold, and keeps it free from damage due to contamination, salt spray, moisture, dust and corrosion. Televisions range from 32″-85″ and are priced from $900-$17,000*. Clients include: MGM Grand, Caesars Palace, Wyndham, Seabourn Encore Cruise Ship, Orlando City Soccer Club, Department of the Navy, U.S.A.
Look for a TV that has been designed with rugged exteriors, is durable and coated to protect the internal components from dust, snow, water, humidity, salt-air and insects. If mounting your television in direct sunlight, check for outdoor tv’s that have screens to handle glare for an optimal viewing experience. Choose an outdoor TV that has been manufactured with air flow systems to keep the system cool, dry and operational from temperatures of -24 degrees F to 122 degrees F.
It is not surprising that outdoor televisions carry a hefty price premium over regular televisions since they are made to work in bright sunlight and withstand the elements of extreme cold, heat, rain and snow. Be sure to include the price of mounting equipment and installation when setting your budget so you won’t have any surprises. Time to head outdoors! Temperatures are warming up for premium outdoor viewing. 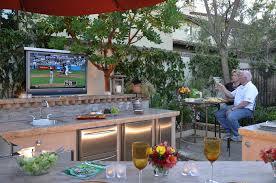 Let our experts help you decide proper placement for your outdoor television. (*Prices of outdoor television as of original publication date of May 2017). Call us at (804)379-1348 or visit us online to schedule an appointment today.